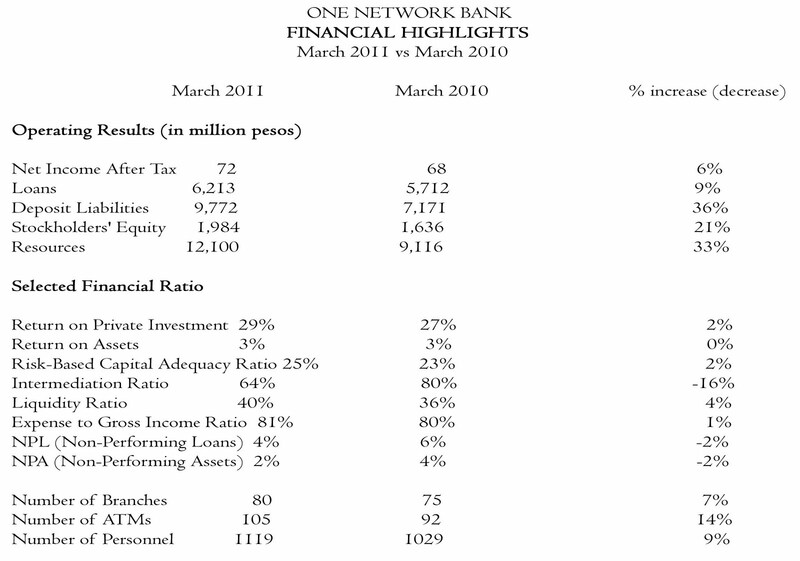 DAVAO CITY - The capital of One Network Bank (ONB) has grown to P1.98 billion at the end of the first quarter of 2011, bank executives announced. 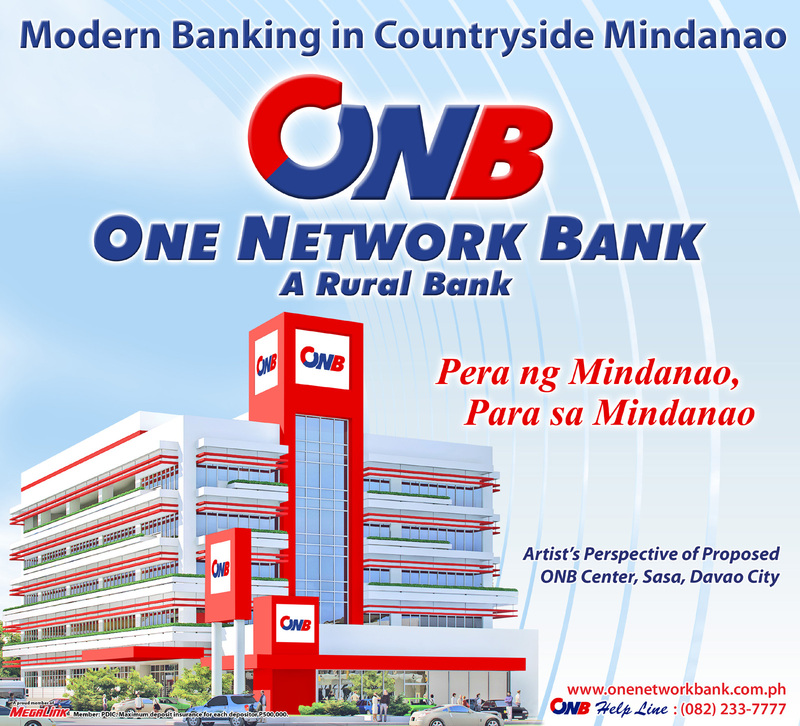 ONB is the Philippines’ second biggest rural bank in terms of capital. It opted not to convert to a Thrift Bank due to advantages as a Rural Bank specifically – firstly because o a better banking industry image as “a big rural bank” as against “a small thrift bank” and secondly because of lower legal reserve of only 1% of Savings and Time Deposits as against 4% for thrift banks. 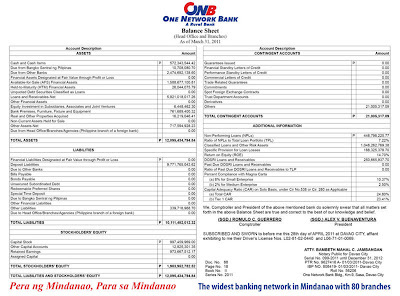 By the end of next year, ONB’s capital is projected to match the P2.4 billion minimum capital required of Commercial Banks and by then, it may opt to convert to the “big bank image” of a commercial bank. 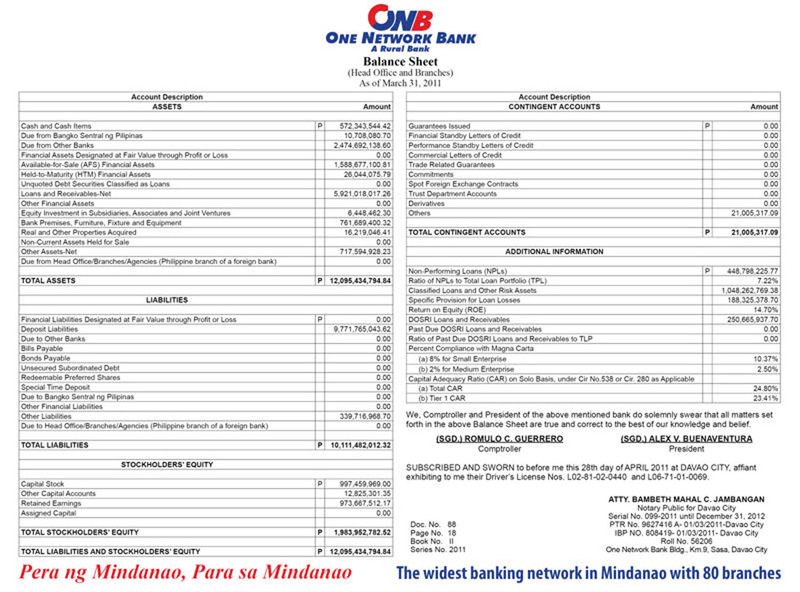 The continuous increase in capital started in April 2004 when ONB was consolidated involving 3 big rural banks in Mindanao - Rural Bank of Panabo, Network Rural Bank and Provident, and the Rural Bank of Cotabato - and when the 100% stock dividends policy or plow back of all earnings, was adopted. An average of P271 million net income per year totaling P1.08 billion over the last four years – from 2007 to 2010 - was plowed back through this 100% stock dividends policy. In terms of earnings in the first quarter, ONB made a whopping P72 million net income or 6% higher than the P68 million net income last year. 1. 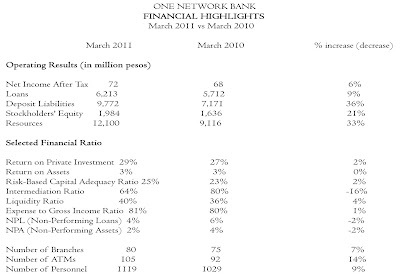 Loan Portfolio increased by 9% from the P5.7 billion in 2010 to P6.2 billion at end of the first quarter this year. The growth in loans volume was accounted for by the 29% increase in Business Loans and the 9% increase in Salary Loans to Department of Education teachers and employees of Local Government Units in Mindanao. 2. Non-Performing Loan ratio has declined significantly from 6% last year to only 4% at end of the first quarter of 2011 which means more loans did perform and earn interest. 3. Volume of Deposits also increased by a big 36% at end of the first quarter this year to P9.8 billion as against the P7.2 billion level in 2010. This contributed largely to ONB’s earnings through higher Treasury Income arising from interest on a much bigger volume of time deposit placements with commercial banks and investments in government securities during the first quarter of this year as against the same period in 2010. The big 36% increase in deposits volume came mainly from big time deposits from high-net worth clients who have recently developed trust on ONB as a “safe bank” as well as from around 50,000 new ATM Card depositors. The outlook for net income in the second quarter of 2011 is very good due to the significant increase in credit demand as indicated by the big number of Business Loan applications being processed, executives said. This is influenced by the good economic condition in all areas in Mindanao where agricultural product prices are in record highs especially copra, sugar, banana, rubber and palm oil.